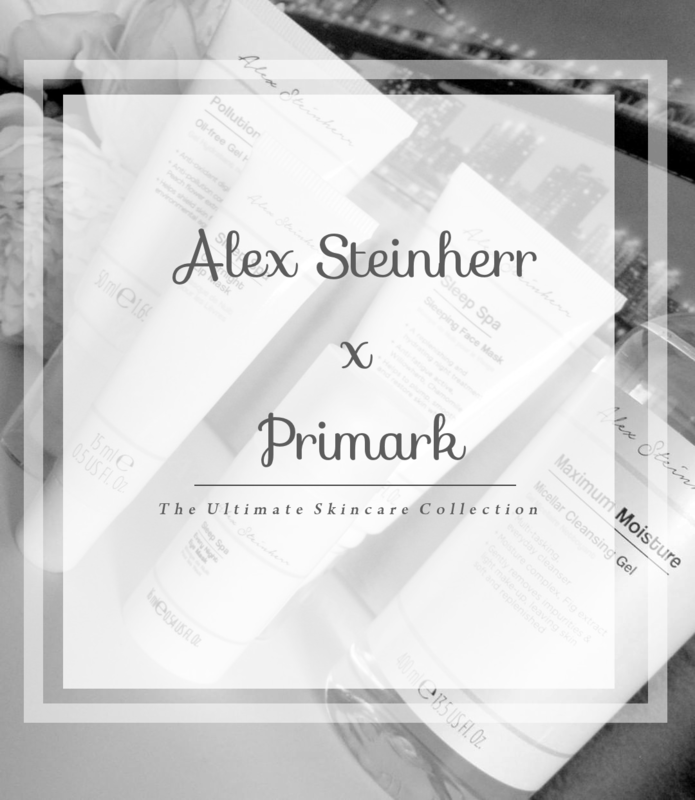 October 2018 saw the launch of Alex Steinherr’s skincare range in collaboration Primark Beauty. It was one of the most highly anticipated ranges to launch and unsurprisingly when it did launch, it sold out immediately. I must admit, Alex Steinherr was someone I had never heard of until her collaboration with Primark was announced. For weeks my Instagram and Twitter feeds were overflowing with excitement over this new launch. We all love good skincare, especially when it’s affordable, so it’s no surprise this new line was a sell-out. Within this, aptly titled, Ultimate Skincare Collection there are five product ranges to cater for different skin types. The five ranges are Maximum Moisture, Plump & Glow, Pollution Solution, Pore Balance and Sleep Spa. With twenty pieces across five ranges there is something for everyone. For reference, my skin is dehydrated and very dry with some sensitivity. I do have issues with visible pores and some fine lines. Hydration is the main thing I look for in my skincare. It’s probably the most important thing for me. Out of everything I got I was most excited for the Oil-Free Gel Hydrator, Sleeping Face Mask and Overnight Lip Mask as my lips are super dry so anything that promises hydration I am all-over. Unfortunately, my excitement was short-lived. I’ve been using these since I got them and I’ve given up on all but three products. The Oil-Free Gel Hydrator and Sleeping Face mask are what I am most disappointed about. They do nothing for my skin. Nothing at all. No hydration, moisturisation, nothing. Nada. They have made literally no difference. The Micellar Cleansing Gel is great for breaking down face makeup, but I need to use a lot of it. It’s not great for eye-make up, even just eye shadow it doesn’t break down fully, I always need to use a cream cleanser or an oil. It is sticky but once I rinse it off, there is no residue or sticky feeling on my skin. The Overnight Lip Mask is nice for a glossy shine, but it doesn’t do anything in terms of hydration plus it’s slightly sticky and uncomfortable. The Micellar Cleansing Gel, Every Night Eye Mask and Plumping Lip Gloss are what I really like out of everything. The eye mask is gorgeous, it feels soothing and cooling and it absorbs quickly. Although it is a night mask, I do sometimes use it during the day. Makeup sits nicely over it and performs as normal. The Plumping Lip Gloss is nice, feels lovely on, it’s not plumping in any way and makes zero difference bar adding some shine, but not as glossy as most glosses in my experience. Overall I’m underwhelmed with the products. As I said above the Micellar Cleansing Gel, Every Night Eye Mask and Plumping Lip Gloss are what I really like out of what I picked up, but do I love them? Would I repurchase them? And the answer is no, no I wouldn’t. I will continue to use them, but I won’t be repurchasing them. I’ve since given the Gel Hydrator and Sleeping Face Mask to a friend, hopefully she will have better luck than I will with them. There were other products from the collection that I wanted to try, but given how underwhelmed I was with these, I’m undecided about whether I’ll pick them up. Have you tried any of the products from this range? I’d love to hear your thoughts on them.